Judith Bourque was born and raised in the United States. She is an award winning filmmaker and holistic therapist. After graduating from Massachusetts College of Art with a Bachelor’s Degree in Fine Arts, she went to India to become a teacher of Transcendental Meditation, and then worked within the TM Movement’s inner circle for two years. She subsequently trained as a teacher of Re-evaluation Counseling, introducing that method to her country of residence, Sweden. 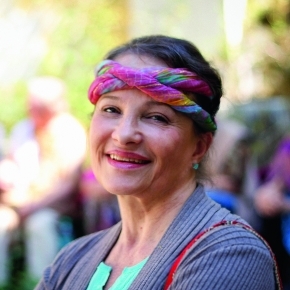 She is an international workshop leader teaching classes in Meditation, Dreams as a Source of Spiritual Guidance, Shamanic Healing and Group Dynamics. After post graduate studies at the Stockholm Academy of Dramatic Arts, she worked at Swedish Television for many years as a film editor, as well as producing and directing independent documentaries. Her films include the “Sowing for Need, or Sowing for Greed?” a documentary on genetically modified seeds, “The Real Patch Adams,” and “Hot and Cold Mandala,” an experiential infrared film. “Robes of Silk, Feet of Clay” is her first book.